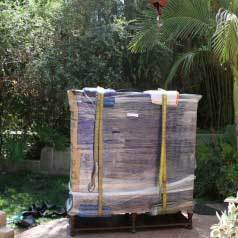 Fastruck Moving and our experienced Studio City movers serviced a 5-bedroom house measuring a whooping 5,454 sqft. It took 6 movers, three 26' and 1 17' trucks to service this mansion. As with any other residential move, planning aspects of such moves must be a priority in order to achieve a smooth, organized and well-rendered outcome. Our seasoned foreman Ross and Eddie were assigned to lead a crew of 4 movers and it took almost 15 hours to relocate this property. While most of the furniture pieces were manageable in terms of human ability to manually move them, there was one piece which required a special service. We have encountered a 1,200lb monster entertainment center and unfortunately were not able to move using just our muscles and shoulder dollies. Additionally, it was located on the 3rd floor of a building without elevator, which made removal even harder. After few minutes of futile attempt to descend the center down the stair we came to the conclusion that it was not entirely safe to do it manually neither to the movers nor the furniture. We contacted Dan from Allied Crane Service - our trusted heavy objects specialist - to assist us with this project. Dan and his time tested crane was on the site within an hour and in a mean time the entertainment center was well prepared for this procedure. We wrapped it blankets, reinforced with shrink wrap and protected the corners with cardboard to decrease the chances of damage. 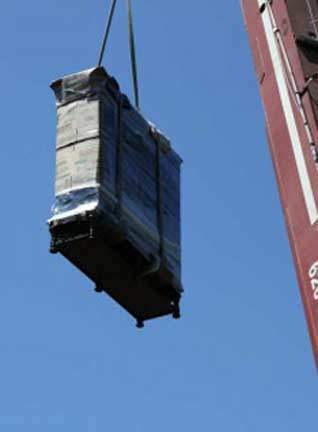 Additionally the points of contact with the lifting slings were triple padded with thick moving blankets to decrease the pressure on the wood. Dan skillfully extended the crane's boom to almost 110 feet under 45 degree angle and lifting nylon slings were attached in a choker fashion and the ends were attached to the crane hook. Finally, crane operator lifted the center and carefully transferred it to the ground. When the item was on the ground four movers had to utilize shoulder dollies to move the center into the box truck. Moreover, two other movers balanced the object on both side. The media center was securely strapped inside the truck and delivered to the destination. Unloading was not complicated given there were no stairs and luckily truck was parked on a flat surface. In conclusion we would like to add that no matter how complicated is your move in Studio City, keep in mind that you can always let Fastruck Moving come up with a solution and provide necessary equipment.